The Scientific Board held its regular annual meeting in FunGlass on March 14-15, 2019. It was attended by all its members – Prof. Dušan Galusek, Director of FunGlass, Alexander Dubček University of Trenčín, Slovakia; Prof. Aldo R. Boccaccini, Head of the Institute of Biomaterials, Fridrich-Alexander University of Erlangen, Germany; Prof. Lothar Wondraczek, Chair of Glass Chemistry – Laboratory of Glass Science, Otto Schott Institute of Materials Research, University of Jena, Germany; Prof. Alicia Durán, Head of the GlaSS Research Group of the Ceramic and Glass Institute, Spain; and Prof. Enrico Bernardo, Associate Professor of Materials Science and Technology at Department of Industrial Engineering, University of Padova, Italy. 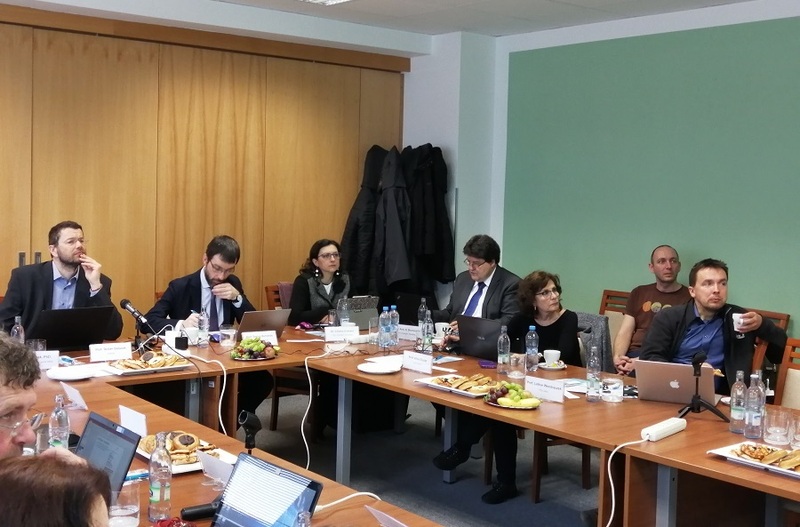 During the meetings SB members evaluated two-year progress in the implementation of the European project for building excellent research centres. Prof. Galusek also provided an update on recent developments during the press conference. The FunGlass Centre is one of the ten Centres of Excellence which have been created since 2017 in the framework of the Horizon 2020 teaming grant scheme of the program for spreading excellence and widening participation of low performing countries in the activities of the European scientific community. Currently, this grant (15 million Euros) is the largest research and development project in Slovakia funded by the European Union and as such it aims to transform the existing glass science and technology centre into a level of scientific excellence that will enable it to successfully compete for EU scientific grant programs. Support and experience in establishing, developing and managing the Centre is provided by partner research institutes of the Italian University of Padua, the German University of Friedrich-Alexander in Erlangen, the Friedrich-Schiller University in Jena and the Spanish Academy of Sciences in Madrid. In the first phase of this seven-year project, the Centre focused on strengthening its personnel capacities, which increased by 61% in the course of the first two years of the project. At present, the Centre operates with 44 employees, of whom 34 are researchers and 10 provide project and administrative support. The research staff of the Centre must meet demanding professional criteria and exhibit high level of theoretical knowledge as well as potential to independently carry out advanced scientific experiments. Thanks to the EU Horizon 2020 funding the Centre provides its researchers with excellent opportunities for professional development. This allowed Centre to attract researchers from Belgium, India, Iran, Spain, Egypt, China, Belarus, Germany and even Mexico and thus strengthen its already established “Slovak” scientific base. The most important part of the curriculum for continuous professional development of researchers is long-term (one-year) residence program at partner institutions. The purpose of such stays is to provide researchers with opportunity to gain experience and know-how from a foreign scientific environment, with emphasis on developing competencies in the operation of advanced research infrastructure facilities and obtaining experience in implementation of international research projects. “To this date, two researchers have returned from partner institutions in Erlangen and Madrid, ten researchers are on training and three more researchers will leave for partner institutions this year. The task of returning researchers will be to pass on the acquired experience to their co-workers, and to further develop the co-operation with partners, either through joint research projects or co-authoring of scientific publications,” said Jozef Habánik, Rector of Alexander Dubček University of Trenčín, an active supporter of the FunGlass Centre. The transformation process of the Centre’s activities is also related to its doctoral program in the field of inorganic technologies and materials. As of today, there are 10 PhD students from Slovakia, Turkey, India and Belarus studying in this program. Thanks to the close cooperation with the Centre’s foreign partners, the FunGlass project offers its PhD students a unique opportunity to gain experience through long-term stays with project partners and the ultimate goal of the FunGlass project consortium is to transform such partnership activities into a dual and/or joint degree doctoral program. An important milestone for further progress of the Centre was the visit of representatives of the European Commission together with the foreign expert reviewers in July 2018. Their task was to evaluate the interim progress in the implementation of the project. The reviewers appreciated the progress achieved and outlined constructive and motivating recommendations for the Centre’s further work. Currently, the Centre focuses on the preparation of the implementation of the project of complementary funding from the Structural Funds (€ 10 million), through which its scientific and research infrastructure will be significantly expanded.